Migration, broadly defined as directional movement to take advantage of spatially distributed resources, is a dramatic behaviour and an important component of many life histories that can contribute to the fundamental structuring of ecosystems. In recent years, our understanding of migration has advanced radically with respect to both new data and conceptual understanding. It is now almost twenty years since publication of the first edition, and an authoritative and up-to-date sequel that provides a taxonomically comprehensive overview of the latest research is therefore timely. The emphasis throughout this advanced textbook is on the definition and description of migratory behaviour, its ecological outcomes for individuals, populations, and communities, and how these outcomes lead to natural selection acting on the behaviour to cause its evolution. It takes a truly integrative approach, showing how comparisons across a diversity of organisms and biological disciplines can illuminate migratory life cycles, their evolution, and the relation of migration to other movements. 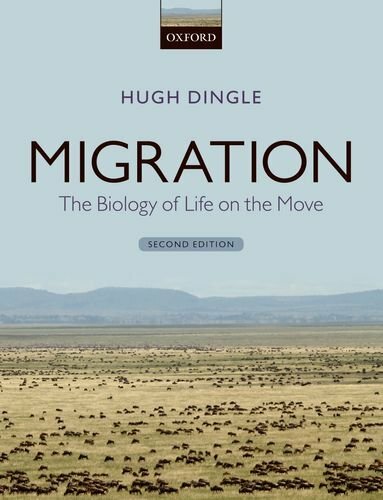 Migration: The Biology of Life on the Move focuses on migration as a behavioural phenomenon with important ecological consequences for organisms as diverse as aphids, butterflies, birds and whales. It is suitable for senior undergraduate and graduate level students taking courses in behaviour, spatial ecology, 'movement ecology', and conservation. It will also be of interest and use to a broader audience of professional ecologists and behaviourists seeking an authoritative overview of this rapidly expanding field. Hugh Dingle is Professor Emeritus of Entomology and the Center for Population Biology at the University of California, Davis where he was a Director of the Animal Behavior Graduate Group. He is Past President and a Fellow of the Animal Behaviour Society and has a B.A. from Cornell and a PhD in Zoology from the University of Michigan. After postdoctoral work at the University of Cambridge (UK) and Michigan, Dingle went to the University of Iowa in 1964 moving to Davis in 1982. After retirement from UC Davis, he was an Honorary Research Consultant at the University of Queensland (Australia) from 2003-2010. He has conducted multi-taxon research on migration in North and South America, Africa, Australia, and Southeast Asia.